I don't know about you, but I like decorating for July 4th. Why? Well, it's all patriotic decor which I can put up for Memorial Day and leave up until Labor Day. So it's basically my summer decor. It may go by many names, patriotic, Americana but it's all just summer. One thing I like to do is make much of my holiday decor. I'm not the greatest DIYer, but it's fun and therapeutic. So I have started to tackle a few 4th of July wreaths. My first wreath was the Yarn Wreath. Then I took the extra yarn and made some patriotic yarn stars for decor as well. My first adventure into the tulle wreaths was this Ohio State tulle wreath I made. I have many wreaths bookmarked to try out, I just can't decide where to start next! I am loving the clothes pin wreath and the bandana one. My kids want to make the rustic wreath. Where do I start?! So tell me which wreath is your favorite? Where do I start? Yes, these all say “summer is here”! 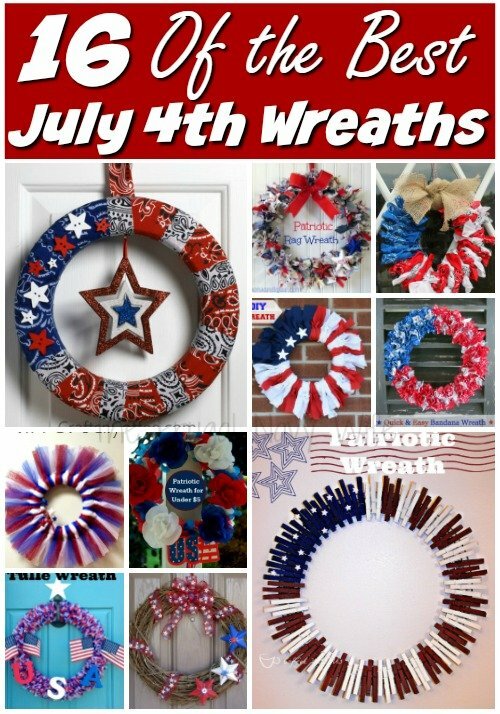 Thank you for including the wreaths from CraftsnCoffee.com. Happy summer! Thanks for including our clothespin wreath! I’m pinning this to all our applicable boards! Your welcome! Thank you for pinning.